This article originally appeared in The Signpost of Weber State University. Thanks to author Matt Handy, it is reprinted here with permission. A group of Weber State University students are following in the footsteps of some of the most influential men in history — not with revolutionary ideas, but with beards. Men such as King Henry VIII, Ulysses S. Grant and Abraham Lincoln all wore beards to add to their scholarly prestige and to distinguish nobility. Expressing oneself as an individual is a common reason a man decides to grow a beard, according to WSU student Isaac VonLeu. VonLeu has a partial goatee, has been able to grow facial hair since grade school, and began shaving at age 12. VonLeu first gave up shaving in high school and was quickly given the nickname “Wolf Man” by his peers. Since then, VonLeu has worn nearly every style of beard, mixing and matching the full beard with and without sideburns, and experimenting with what he thinks looks good on his face. Female students Brooke Estes and Stephanie Healey have their own take on guys with beards, and what it is like to be a female and unable to grow a beard. “I have to admit I am a little jealous that I don’t get to experiment with facial hair, because it mixes up your appearance and identity,” Estes said. Both Estes and Healey agree that facial hair can drastically affect a man’s appearance. “I look at some guys and think they would look good with sideburns, but I have never seen a guy and thought to myself ‘He would look good with a big beard,'” Healey said. 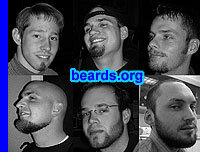 Sharp is not alone in the belief that facial hair gives off the appearance of looking older. Twenty-three-year-old [name deleted] decided to grow a full goatee eight months ago and has noticed that people treat him differently now that he has facial hair. WSU student Niels Lund has a neatly trimmed short beard that he only shaves off about twice a year. Lund has had a beard since he was a sophomore in high school and thinks of it as second nature. Lund believes there are no downsides to having a beard and wants people to know that it is a misconception that beards are rough.